AMOUR 10k Yellow Gold 9.5-10 Mm Tahitian Black Pearl Pendant Necklace 17"
Each beautifully unique cultured freshwater pearl has a round, with beautiful luster look that creates a stand-out style all strung together. Marked '585' for 14K gold on the spring clasp but not on the lobster clasp. Sterling Silver Diamond 9 - 9.5 MM Black Tahitian Pearl Swirled Fashion Pendant With 18" Chain GH I2;I3. This exquisite necklace from the Amour Collection features a 9-9.5 mm Tahitian drop black pearl adorned with round white diamonds set in sterling silver. Gift this fun pendant to the animal lover in your life! An 8 mm freshwater cultured button pearl sits central in this sterling silver bunny rabbit pendant, complete with round-cut created pink sapphires, totaling 1/8 ct, on the ears. Piece measures 1 1/8 by 9/16 inches. Comes with a sterling silver 18-inch cable chain with a spring ring clasp. 8 mm Freshwater Cultured Button Pearl 1/8 ct Round-Cut Created Pink Sapphires Sterling Silver Measures 1 1/8 by 9/16 Inches 18-Inch Cable Chain . Beautiful pearl enhancer set in 14kt solid. 585 yellow gold set with 3 rubies and 3 diamonds. The pearls have a very good luster with no wear or scratching to the surface. The necklace is made out of white irregular shaped mother of Pearl with tiny silver beads in between. Yhe necklave is in great condition. Due to the difference between different monitors, the picture may not reflect the actual color of the item. We believe that a good communication will be helpful for solving the problems. Processing orders. Style: BeadedLength: 18 - 19.99"
THIS IS A GENUINE CULTURED PEARL IN A ONE OF A KIND HANDCRAFTED 14KT ROLLED GOLD SETTING. Rolled Gold wears, looks and behaves like 14kt gold. 7 THINGS TO KNOW ABOUT 14KT ROLLED GOLD. Gold fill jewelry is also referred to as "Rolled Gold" jewelry. This is a beautiful around 16" white pearl necklace featuring genuine 8-9mm cultured freshwater pearls. The strand is hand knotted between each pearl with silk cords. Good quality pearls at an affordable price! Excellent condition signed Charles Albert sterling silver and blister pearl pendant. 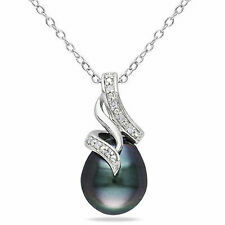 This is a very shinning and highest luster cultured Akoya white and black Tahitian pearl pendant necklace. The pendant is made with white gold plated, stunning with lots of excellent cut lab diamond. A beautiful choker style white Freshwater Pearl necklace, each pearl is hand knotted into a single strand with a sterling silver clasp. Pearl size: 6 - 7mm. Material : pearl. Style :NECKLACE. We are very fair and easy to deal with! Hand knotted between pearl and pearl . Q: Can l get my necklace or bracelet in a longer or shorter length?. Q: Are these real genuine pearls?. Q: You say these are real pearls, why the prices are so low?. 100% natural pearl. hand knotted between pearl and pearl ,with a 14K gold clasp. I have only one about the necklace. The necklace is strung on double silk threads, knotted between each pearl for security and durability, finished with a very elegant. pearl size: 7-8 mm. Q: Can l get my necklace or bracelet in a longer or shorter length?. Metal: Yellow GoldStyle: ChainLength: Over 35"
Any item sold by the Seattle Goodwill is eligible for local pick up at our warehouse. We do our best to provide accuracy. This also applies to combined orders. No exceptions can be made. It is marked for Sterling Silver. It is signed ITALY. The 7mm high quality real cultured pearls have a very nice luster and shine. It is a great piece that you will wear often. Tahitian Peacock Black Pearl Necklace, with Blue and Green Undertones. Note: Sea Shell Pearls are not natural pearls. Necklace is professionally hand knotted by double silk threads between each pearl. 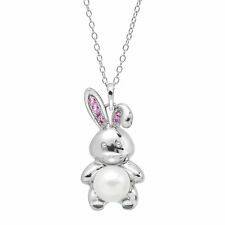 A beautiful Sterling Silver 8-8.5mm AAA Hand-picked Pink Round Freshwater Cultured High Luster Pearl Bunny Pendant with. 01tcw Diamond on an 18" Length Chain Necklace. We Carry Different Color Of Pearl, Different Size Per Pearl, and Different Weight of Diamond. New Listing JAPANESE CULTURED GENUINE BLACK PEARL FINE NECKLACE 14K SOLID GOLD CLASP 16"
This necklace is in perfect condition. This classic and sophisticated necklace will never get out of style. The clasp is in ideal shape and secure. VINTAGE SEED PEARL NECKLACE WITH 14K YELLOW GOLD BEADS AND CLASP, 22 inches. Condition is Pre-owned. Shipped with USPS First Class Package. Freshwater Pearl. Natural Freshwater Pearl. Loose Bead. Each Pearl is unique and tiny different size. Handmade Bracelet. Fine Jewelry. • This cute pendant features a cat design made of genuine mother of pearl with beautiful luster and opalescence on both sides. New Listing925 Sterling Gold Plated Ross Simons Pearl Cluster Design Chain Necklace 17-20"
The pendant has a high polished 14K yellow gold high polished 5mm, 2.5mm balls and 6mm bail (loop). Cooperation happy! Luster : Excellent Luster AAA. 100% natural, real pearls. Because of the variance in sizes of natural gemstones, lengths could vary ~0.5in. If you are not 100% satisfied with your. 52in total length light aqua fresh water pearl and aqua semi precious stone enhancement. Sterling 925 Box Chain Italy with Pearl in Cage Pendant Necklace. Condition is Pre-owned. Shipped with USPS First Class Package. New ListingPEARL NECKLACE, 14K CLASP, 3 STRANDS, REAL OR FAUX? PEARL NECKLACE, 14K CLASP, 3 STRANDS, REAL OR FAUX?. Choker length. Not an expert in pearls, but they are beautiful! Material :pearl. Style :necklace. Length : 18". Condition: New. HOT 18" 9-10MM REAL AUSTRALIAN SOUTH SEA GOLDEN PEARL NECKLACE. The necklace is hand knotted between each pearl use double silk thread. Color: GOLDEN. Q: Can I get my necklace or bracelet in a longer or shorter length?. Beautiful and long pearl necklace. NEW HOT Huge AAA 16mm Golden South Sea Shell Pearl Pendant. Cooperation happy! Luster : Excellent Luster AAA. The necklace is strung on double silk threads, knotted between each pearl for security and durability, finished with a very elegant. Item number: J21836. Pearl Style: Genuine Chinese Fresh Water Cultured Pearl, 100% natural freshwater pearl. 100% natural color with platinum overglow, Vibrant glowing surface. The natural ripples exist on the pearl’s surface are typical to genuine pearls. This pair of earrings is made up of 2 natural baroque South Sea pearls from Australia of approximately 15mm in size. Each pearl has very good luster and each earring comes with a white gold back. Pearls are genuine akoya pearls. Setting type: Pearl knot. Clasp: 14K GOLD. Pearl shape: perfect round. Freshwater Pearl Necklace & Bracelet Set w 14k Gold Clasp. Condition is Pre-owned. Shipped with USPS Parcel Select Ground. Genuine Akoya Pearl Necklace. 14k Gold clasp. 18". Certified. Fashion 10mm Colorful Genuine South Sea Shell Pearl Necklace Knotted Necklace18"